This hotel has had a major overhaul and is now found under Las Gaviotas Suites Hotel, try googling it. Beautiful hotel, very contempory, dark wood, cream leather, cocktail bar etc. Very very clean. If poss book a suite, (which they mainly are now) for extra room. Large balconys with real balcony furniture not plastic table and chairs. The decor of the hotel and rooms is wonderful. Fridge, tv, tea/coffee facs etc in the room. Huge showers with plenty of hot water. Towels, bedding etc all changed daily.Plenty of warbrobes with hangers and extra sheets, pillows n balnkets. Air con. Meals were lovely, huge selection, pancakes, omelettes cooked fresh for breakfast and meat, fish and grilled veg cooked fresh for evening meals. The usual salads, veg, soup, stews, desserts etc. Very little entertainment however and no childrens club as of yet. There is a childrens park next to the main pool with water play cannons etc. Pool bar food is fantastic, pastas and meals not just sandwiches. The hotel is on the roadside but the rooms are mainly around the other side so you hear nothing. Beach is a 5 min walk away. Bus stop directly opposite the hotel with a taxi rank, taxi into the port is a few euros. Plenty of shops n bars surrounding the hotel. Would recommend this hotel to anyone and wish we were going back this year. Arrived at 6.30am due to flight delays, as we were late arriving and would not still be awake at breakfast the hotel had provided 2 platters of food meat cheese bread and fruit. Just unfortunate that when we arrived they were not chilled! I went on a girls holiday with my friend and shared a twin room. The room was fairly small, but there was ample wardrobe/storage space and a roomy bathroom. Rooms were very clean and of modern decoration. The hotel had been refurbished shortly before we went so therefore everything was looking at it's best. Food we found to be very good plenty of choice for adults or children. I am a fairly fussy eater and there was not one occasion when there was nothing available that I would eat.There was no restrictions on the quantity you ate and children were allowed to help themselves if they were able. Restaurant can get very busy at times, but the waiting staff were very efficient during our stay. Pools and surrounding areas were kept immaculately clean. Only downfall I would say would be the shortage of sunbeds. Just back from Las Gaviotas. The apartment was clean and a good size, ideal for my husband and I and two teenage children if a little dated decor wise. We were initially unfortunately located just above where the diabolical entertainment was staged. However we moved after a couple of days to a much better location just above one of the fantastic pools. These really are a great feature of this hotel - two large and one baby pool, always clean and lots of sun loungers too. 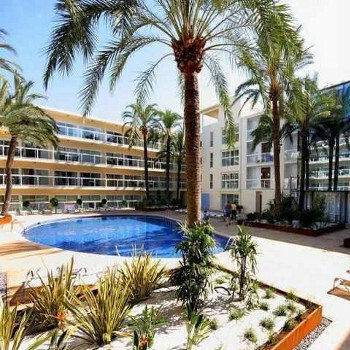 The hotel was in a good location in the resort of Playa de Muro but a few miles from the main resort of Alcudia. But it tells you that in the brochure anyway. It was across a main road to the beach but still an easy walk to it. The hotel looks nothing from the outside, but the apartments are wonderful and large, ours had a full size fridge freezer, microwave, toaster and kettle, the rooms are kept clean as is the rest of the hotel. The staff are very good and cannot do enough for you. We had a problem with a leaking air conditioning unit in the lounge of the apartment which was attended to very promptly. There are three pools which are kept very clean and there are enough sunbeds to go around especially as we were on holiday at the busiest times of the year. Entertainment is a little sparse in the hotel but plenty on offer in the resort. When we arrived at these apartments we thought they looked a bit tacky from the outside but pleasantly suprised when we walked in. The foyer was all marble floors and immaculately decorated. Our apartment was immaculate and cleaned daily, our apartment had 2 bedrooms 2 bathrooms one of them en-suite which was hugh i have never stayed an apartment as big as these the balacony was hugh. They have great facilites for children no kids clubs but a hugh swimming pool with baby area, a jacuzzi and a mini park also water fountain games. The only down side to these apartments would be they are not in a very good area and you would have to travel for entertainment as this hotel has rubbish entertainmet. We stayed at the Las Gaviotas in September we thought this was a really clean hotel and the apartments were really large we stayed in a 2 bedroomed apartment which was very good. The beach is right across the road and there is 3 large pools at the hotel which are cleaned daily. The entertainment wasnt up to much but we went out every night so it didnt bother us too much. Theres something for everyone as this is a real family resort. Overall we had a really good time the only thing that put a downer on the holiday was the wather it rain almost non stop for the whole two weeks we were there but that has nothing to do with the standards of the hotel. good value for money and brill location. We stayed at the Las Gaviatos hotel and found it fantastic. From the outside it doesn't look that much but once inside it is lovely. It is very clean, friendly and in a good location. Close to a fantastic beach and offers of days out if you fancy it. The food was lovely and the menu variety was good. Our children enjoyed it. The staff were very friendly and always on hand if you need them. We booked a trip via the hotel and they were very helpful with all details that we found we needed. I liked the fact that the room was cleaned everyday and the sheets every other day with fresh towels everyday. The entertainment wasn't that great but there is alot to do in the surrounding area. Highly recommended! Very high standard of cleaning in the room, reception, bars and swimming pool. Very helpful staff - they all say Hola! to you. The entertainment was a little lacking but the magician was top notch, very funny and some amazing illusions. Karaoke night was good too. The only bad thing was the mini-golf. It consisted of 6 broken mini-golf holes in a fly infested patch to the side of the hotel - I will say to First Choice not to include that as a feature in their brochure until it's replaced. However down the road is the Tropical mini-gold with 36 holes over two courses for 6 euros. If you booked this hotel then congratulations you've picked a winner. Having just returned from a 2-week holiday at Las Gaviotas, Alcudia, I have many memories. Some of them good, and some of them not so good. The hotel is ok, but not more. The rooms are horribly decorated, with a disgusting green colour scheme, but that isn't what I disliked the most: The floors were extremely poorly cleaned, and we where forced to sweep it ourselves in order to walk around there without shoes. The pool is quite nice, and in good shape. All in all an ok hotel, and good value for money, but I' sorry to say I won't come back. We really enjoyed our stay at Las Gaviotas, weve enjoyed it that much, this is the third time of coming here in the last 12 months. Its great for the kids as the beach is just across the road and they have 4 pools to choose from. The local bar called JP's if a fantastic british family bar and it is run by a spanish family.